First and foremost, buy this freaking book. 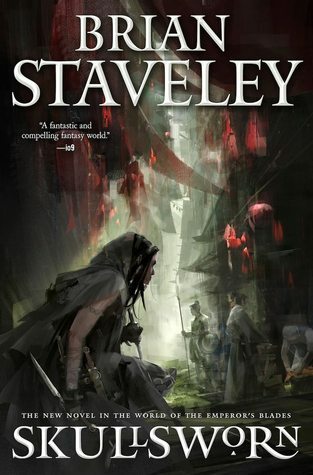 You already know Staveley is a fantastic writer if you read his Unhewn Trilogy (which, if you haven’t, do yourself a favor) and this novel is no different. Unlike myself, because I enjoy letting all of the words sink in through every pore, anyone can pick up Skullsworn, sink their teeth in, and finish with relative ease, as it is only about 300 pages. The writing is beautiful and mesmerizing, the world-building is vividly imagined and thoroughly detailed, and the characters will bring out personal cheers and exultations from the reader. One who is right, and one who is wrong. Severed from life, shorn of breath. Deliver a mother, ripe with new life. Find the kindness in the sharpest knife. There are no words in his domain. Who will not come again. This is the test/trial for our strong, female protagonist, Pyrre. She is an acolyte to Ananshael, the God of Death, and to become a priestess, she has fourteen days to deliver these seven to her God. The killing comes easy, for the most part, as she has trained for this almost her entire life, but when love enters in, will she be able to pass the trial? Pyrre has never been in or known true love, at least that is what she thinks. If she can’t complete her trial and find what love truly means, she will have to offer herself to Ananshael. She must travel through croc-infested marshes, deal with the dangers hidden within, and come across peoples thought dead or myth to prove herself to her God. “A grape tastes like a grape? Of course not. Until you bite the grape, it has no taste. It might as well be a stone plucked from the cold current of some river in autumn: a smooth, chill orb, reticent, flavorless. You could hold it trapped between your palate and tongue forever, only the faintest hint of juice at the tiny breach where it was plucked from the stem. Like I said before, the writing is beautiful and mesmerizing and that quote just did it for me. Last thing, and this needs to be mentioned, Elizabeth Knowelden killed the narration. With some tough Simon Vance-filled shoes to fit into, she was flawless in bringing out the essence and passion of the story. Each character stood alone with their own voice, which is what you need to make an audiobook worth the time and money invested. Kudos to her and I hope that Skullsworn is her ticket to more gigs. Loved this one. Pyrre was one of my favorites from the main series. I need to go back and finish the main series. I went through Book 1 and really enjoyed it. Too many books, too little time.